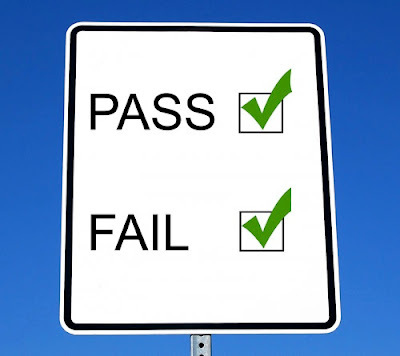 While the NFL has become a pass happy league and passing is the best way to put up points fast, it is not always what wins games. However, balance between a elite passing game and a good running attack is what separates contenders from pretenders in the playoffs. This is one of the reasons that the Eagles turned out to be the ultimate phony last year. Instead of clinching the No. 2 seed in week 17, resting up with a bye week, having a chance to advance with a home game and finally ending their 50-year title drought, they hit rock bottom. The Eagles disappearing act could be blamed on ball control, or lack there of. Ball possession is critical in games where it becomes all out war between the trenches and unfortunately the Eagles pass happy offense negates this. Andy Reid’s offense averages pass plays about 70 percent of the time which forces the offense to be nearly perfect in order to beat elite teams in the NFL. The gross inaccuracies and high inefficiencies of the offense, which it was from time-to-time with Donovan McNabb at the helm, causes countless other problems. First the clock stops as the ball hits the ground, which helps to give opponents more time for their offensive possessions. For teams with a balanced attack, it allows them to chew more time off the clock and gives fewer opportunities for their opponents to score. Not only do incompletions affect the offense flow, but also when the drive stalls it also has a ripple effect on the Eagles defense. The defense is asked to spend more time on the field against high-powered offenses. Eventually fatigue will set in on the defense and when it does the floodgates open. This was no more evident than in the two horrifying losses to the Cowboys to end the season. The Eagles continually tried to throw the rock and completely abandoned the running game. With the Eagles struggling to move the ball on seemingly every possession, the Eagles defense finally broke down. A defense can only bend-but-not-break for so long. As the game wore on, Felix Jones broke off a huge play, which led to Tony Romo’s play action passes being more deadly. Lastly, the massive Cowboys’ offensive line wore down the Eagles smallish front four. By the time the clock hit zero, the defense had been exhausted and the pass happy offense was off for the summer. Besides that Cowboys game, the Eagles struggled to run the ball last year throughout the season. 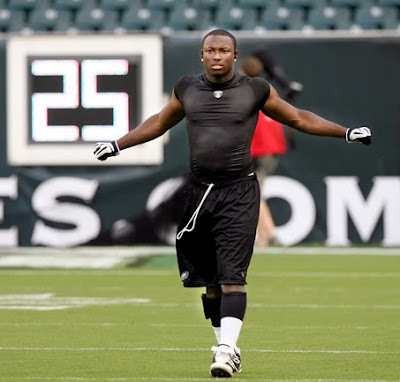 There were 34 running backs in the NFL that finished with more rushing yards than the leading rusher for the Eagles, which was LeSean McCoy with 637 yards. Of course, McCoy did not get the chance to start every game, but looking at the last four games of the season it is clearly obvious the Eagles decided to throw away running the ball from the playbook. In those four games, McCoy ran the ball a total of 21 times. The amazing part about that is he amassed 103 yards, which means that per carry he averaged 4.9 yards per carry. More amazing that in the two games in Dallas he only touched the ball a total of six times. 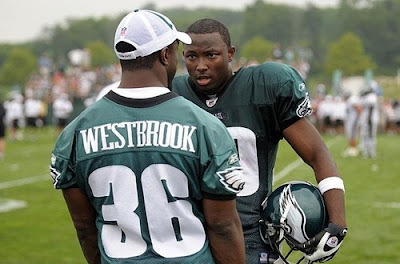 Certainly the Eagles were down by a lot in both of those games and Brian Westbrook played so that influenced the amount of touches McCoy received. However, the Eagles failed to recognize two things with their club. First, that at this stage in his career, Westbrook was not an upgrade over McCoy. It was clear on tape, McCoy lacked average pass protection skills as opposed to Westbrook, but in terms of but finding and hitting holes, McCoy was an upgrade. Sorry to say, it was not just the Dallas game where the Eagles overlooked the running game. There were only three other teams (Cardinals, 49ers and Colts) in the NFL that had less rushing plays then the Eagles, who finished with 384 rushes. Furthermore, the Eagles ranked in the bottom half of the NFL in rushing yards and yards per game as they registered 1,637 yards and 102 rushing yards per game, which was 22nd best in both categories.Moreover, the bigger failure by the Eagles coaching staff not game planning around their mediocre defense. During the second half of the season, the Eagles failed to stop anyone. In those eight games, the defense gave up an average of 26 points again. If the Eagles were going to beat anyone in the playoffs, they were going to have to learn the nuances and art of running the football. It was the only way to keep a porous defense off the field and good offenses from scoring at will. Sadly, the Eagles missed the boat and their season left a sour taste in every Eagles fans’ mouth. The shocking part in all of this is that the Eagles finished in the upper half of the league in average rushing yards. They were tied for 12th in the league with an average of 4.3 yards per carry. Many experts say that the Eagles fans and experts insist that the Eagles do not run the ball because they cannot, which is far cry from the truth. They just choose not too. Ultimately, the choice by Reid and offensive coordinator Marty Mornhinweg to desert the running attack was apparent against teams above .500 or was playoff caliber teams. These were games that the Eagles struggled to win. One of the reasons was due to ball control and the unbalanced play calling. In six games against teams above .500 or who made the playoffs, The Eagles won only of those games, which came against the wounded Atlanta Falcons who were without (RB) Michael Turner and (QB) Matt Ryan. More importantly, in those particular games, the offensive balance was nonexistent. Mornhinweg dialed up an eye-popping 240 pass attempts and just 106 running plays. That is more than twice the amount of passing plays as they called running plays. Usually in a typical West Coast Offense, screen passes and short passes are considered to be like running plays. Although the amounts of screen passes thrown were down and McNabb was not accurate enough to rely on the intermediate and short passing game. Essentially, the Eagles were asking McNabb and even Kevin Kolb to be superman and win games with their arm. Not many quarterbacks have the ability to carry a team on their back without the safety blanket of a running attack. Nevertheless, it is a new season for the Eagles and fresh start with all the new faces in camp. Moreover, they do not have the strong armed and veteran presence of McNabb under center anymore. 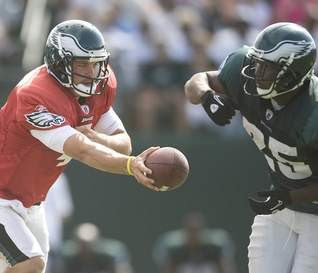 Over McNabb’s 11-year tenure in Philadelphia, Reid relied on McNabb’s arm and ability to change into his superman costume when he walked onto the playing field to guide the Eagles to victory. Now, he turns to an inexperienced, but promising quarterback to lead the way. If Kolb is going to exceed in being an elite star quarterback in this league, he is going to need help from his teammates because he does not have the arm strength to crank out 40 throws a game and make it through an entire 16-game slate. Additionally, Kolb is not the only one that stands to benefit from a strong running game. The defense has 11 games against the best quarterbacks that the league has to offer in Aaron Rodgers, Peyton Manning, Eli Manning (twice), Matt Schaub, Tony Romo (twice), Brett Favre, Donovan McNabb (twice) and Matt Ryan. Without a doubt, the Eagles defense should be much improved in the second year under Defensive Coordinator Sean McDermott, with the acquisitions of Nate Allen, Brandon Graham, Ernie Sims and the return of Stewart Bradley. But they will still fail, if they have to be on the field for 35 minutes or more per game, which means Reid has to run the ball. When week one rolls around, the Eagles are going to look at an elite quarterback in Rodgers, who’s situation has been eerily similar to that of Kolb. 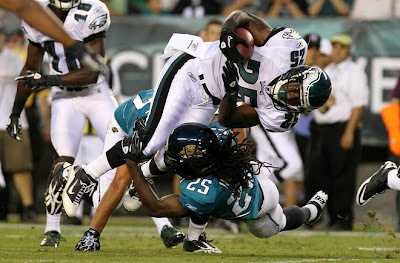 The Eagles are going to hope Kolb can emulate his career. However, what they should notice is that (RB) Ryan Grant makes his life much easier and allows him to be in the upper echelon of quarterbacks. In order for Kolb to be deemed a top QB in this league, Reid and Mornhinweg must utilize the weapon they have in McCoy and keep it on the ground. Otherwise, the Eagles’ running game will not be the only thing that is grounded; it might be the entire franchise.